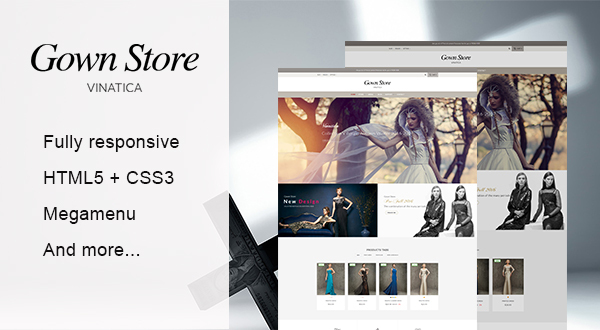 Ap Gown Store Prestashop theme will bring an awesome surprise for everyone and meet high expectations towards high fashion stores. The luxurious beauty of the homepage will catch your eyes at once. The logo is placed right in the center with the intent to make visitors pay attention to the brand immediately and stick the name to their mind. Ap Gown Store Prestashop is also designed with a large slideshow and high resolution banners, where you can showcase best sellers, top trending collections or hot deal seasons. It seems like you are turning your online shop into the New York fashion street and no one can resist to exclaim “Wow!!!”. The custom-built Live Theme Editor and Panel tool are powerful tools to design the storefront from top to bottom, for example the color of the text, layout mode, floating style or background skin. Moreover, thanks to Carousel, all products of every collection will be shown up automatically in Product Tabs neatly and vividly. To make the site become more dynamic, hover effects are used and blend seamlessly with the images and icons ingeniously. For shop owners, a friendly back-end dashboard is a must, allowing them to save time setting up but spend more time boosting sales instead. With Ap Gown Store, this feature is totally achievable since the theme is built with Ap Pagebuilder Framework – one of the best Prestashop frameworks. You can change the layout of the homepage just by simple action: drag and drop. Finally, the theme is fully responsive and supportive to CSS3 and HTML5, helping create a refined web pages with semantic accuracy. Any question, please feel free to ask us via email: apollotheme@gmail.com , live chat or Q&amp;A on our website: http://apollotheme.com/.